The XA CONTROL found in the Motif XS and the S90/S70XS, the Motif XF and MOX6/MOX8 and now MOXF-series puts this expressive feature under your fingers so that you can better articulate musical phrases by making available different behaviors controlled by how you touch the keys and interact with your physical controllers (buttons, pedals, etc.). The increase in the number of Elements is primarily used to give the performer more ways to alter the sound during a performance. Changing how the instrument responds beyond just the two dimensional play you get with most sample playback instruments. For example, the legato articulation detects when you connect notes in a phrase and will access a different Element to sound… rather than retriggering the attack of the instrument sound, this articulation control will access a non-attack Waveform. If you attempt to do a guitar “hammer-on” with this legato you do not hear the guitar pick on each successive note - the XA CONTROL - legato - smoothly transitions to the “legato Element” which does not have the picked attack. When articulating a bowed string or woodwind instrument phrase where there is one “stroke” or one “breath” but several notes in the phrase, on a standard sample playback instrument every note is attacked, attack-attack-attack, but with XA (expanded articulation) control your phrases sound more natural as the attack only occurs on the first note in the phrase and the rest can be “woven together” without the same attack portion of the sample. And that is just one of the different uses for XA CONTROL. And now with the MOXF having 128 notes of polyphony, more options for XA CONTROL are revealed. A major concept change in the arpeggiators occurred in the MOX - more than just flourishes of notes, arpeggios take on the role of dynamic music performance phrases, and even mind-bending controller gestures that can be applied in chord intelligent, tempo synchronized manner to your performance of music.They are flexible and highly interactive, even the drum Arps can be interactive to the player’s velocity. Designed principally for recording directly to the internal (or an external) sequencer, these can be used to control internal or external devices, and can also be used in “live” performance. Complex musical effect type arpeggio phrases with creative velocity zoning brings another whole dimension to the classic Up/Down, Down/Up, and Random modes of arpeggiators-past. The MOXF adds new content (including phrases appropriate for “endings"). • Two sets of 4 Knobs x 3 rows of functions [Knob Function 1]/[Knob Function 2]: Parameters for real time control of the current VOICE or selected Part (when in Performance or Mixing modes). •	Press both KNOB CONTROL buttons together to create four side-by-side VOLUME and four side-by-side PAN controls for the PERFORMANCE Parts 1-4. Works for MIXING PARTS, in groups of fours: 1-4, 5-8, 9-12 and 13-16, depending on the currently selected TRACK 1-16. VCM technology from Yamaha is widely respected and is used in today’s boutique studio processors (including the Neve Portico series). This cutting edge technology use complex physical modeling to accurately reproduce the classic processors of the recent past. There is a suite of VCM Effects recreating stomp box effects, classic wah-wah, EQ’s and other essential studio rack items - all trickled down from Yamaha’s market leading, large format digital mixing consoles, and Yamaha’s cutting edge Rev-X reverberation taken directly from the SPX2000. It is easy to say that no synthesizer workstation has had this level of available processing in this price point! Now eight PARTS of your SONG/PATTERN MIXING program can recall their dual Insertion Effects simultaneously. This translates to more complexity and definition in your mixes… Dual Insertion Effects are available (always) when multi-track recording to a DAW via the MOXF’s built-in dual stereo USB audio interface. In plain talk, what the “4-in” means is the MOXF acts as an audio interface - a way to send audio into the computer on four audio channels. In the case the four channels are configured as two discreet stereo buses. USB 1/2, and USB 3/4. You can assign, for example, a vocal mic to one set of outputs, and your playing to the other, allowing discreet recording of each, simultaneously, to your DAW. The “2-out” refers to the main Left/Right Outputs of the MOXF which you connect to a quality pair of monitors, like the Yamaha HS8’s, all computer audio and the audio of the MOXF are routed to this output. The MOXF becomes your computer’s soundcard. All sound will travel through the MOXF. This is an important basic to understand. The MOXF not only is a workstation with an internal sequencer, but it can link with external computer DAWs to increase your music making power. Data can be synchronized so creative Multi-tracking is in available. Four simultaneous inputs to the computer, which will be used to MIXDOWN your composition to two outputs. The finished mix is typically a stereo file. Yamaha’s commitment to hardware/software integration is illustrated with the MOXF6/MOXF Editor Standalone/VST - allows the MOXF to work well within the computer environment. It can run inside any VST3 compatible DAW or along side any DAW. The Audio interface uses the Yamaha Steinberg USB ASIO driver which means you can use any major DAW you desire (Cubase, Nuendo, Logic Pro, Sonar, Pro Tools, Digital Performer, Ableton Live, Reason, FL Studio, Studio One, etc., etc.) basically any DAW that is able to support an ASIO driver. •	DAW REMOTE templates for Cubase, Logic Pro, Sonar, and Digital Performer. When you use the MOXF with Cubase, you can use the AI KNOB to move the transport, or as an assignable controller. When working with a soft synth (VSTi) inside of Cubase, you can setup the front panel buttons and knobs to whatever available function you find most useful, but even better is the AI KNOB. Simply hover the mouse over the parameter in the computer and the AI KNOB is instantly controlling it. This ‘hover and control’ is so quick and easy, ten seconds of working with it and you understand why this is a BIG DEAL. 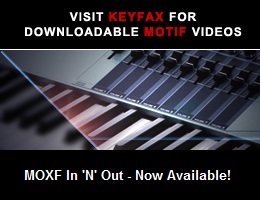 *The MOXF does not sample; it is able to playback audio samples. Flash means you will always be able to add new content, be it Sampled Voice libraries of new full instruments, audio loops, or even your own backing vocals for your songs! It can access sample data that has been installed on a Yamaha FL512M or FL1024M Optional Flash Board (sold separately). Flash boards hold data between power cycles, yet are user rewritable. Data is installed via USB drive in a process similar to the LOAD FILE routine. Data is divided into two TYPES: WAVEFORMS and SAMPLES. This occurs when, for example, you already have your favorite data installed on your FLASH BOARD, but you are placing that BOARD in a new MOXF. In such a situation you will simply need to load the WAVEFORMS (not the Samples) because the FLASH BOARD already has the large sample data, you only need to make the new MOXF aware of how the samples are organized on the Flash Board. Waveform information loads extremely rapidly compared to Samples data (due, again, to the size of the data). ...and there will be times when you want to load data without changing either one of them! This can occur when your collection of VOICE Libraries exceeds the number of Voice locations you can have simultaneously on-board the MOXF. There are 384 Normal User Voice locations and 32 Drum User locations, where you can store your edited and new Voices. You can have thousands of Voices in Files, they all cannot be simultaneously in USER locations on-board, obviously. In this case, because the large AUDIO data for the sounds is ‘permanently’ in place either in internal Wave ROM or on your custom Flash Board, you can simply load the Voice parameters (without the Waveforms, without the Samples) - no need to wait minutes for data to load… you can load just the Voice parameters in seconds, literally, 3 or 4 seconds! This is the advantage of Flash, the “big data” remains available between power cycles. Loading Voice data is quick and painless. FLASH not only allows the user access to new sounds but it is very important when considering whether a keyboard “gets old”. FLASH means you can reinvent your instrument every time you press the [EDIT] button. And because the FLASH BOARDS are re-writable, you can change you mind as often as wish. Using your downloadable copy of Cubase AI7 you can record audio tracks via the MOXF’s built-in audio interface (plug your dynamic microphone directly into the MOXF, process it with cutting edge effects, record it to an audio track). You can then export audio that you have recorded to Cubase in 16-bit/44.1kHz format - these can then be imported to the MOXF and installed on your Flash Board… allowing you to ‘take the magic of the studio with you to the stage’. Once installed on the FLASH board, the audio (your custom audio) will always be accessible as Wave data! Basic point: SAMPLE data remains accessible even after cycling the power (power down/power up). Your custom selected data remains as instantly accessible as the Preset Wave ROM. •	A single FLASH BOARD adds either 512MB or 1024MB (1Gig) of rewritable memory for custom data. •	There can be 2048 Waveforms containing as many as 8192 individual Samples. •	All Waveform/Sample related data is based on “whichever comes first”. If any of the limits is reached you will be out of sample memory. That is, if you use up the 8192 individual Samples before you reach the 2048 Waveform limit or the 1024MB limit, you will be out of memory. If you reach 1024MB before you reach 8192 samples or 2048 Waveforms, you will be out of memory, and so on… whichever comes first.